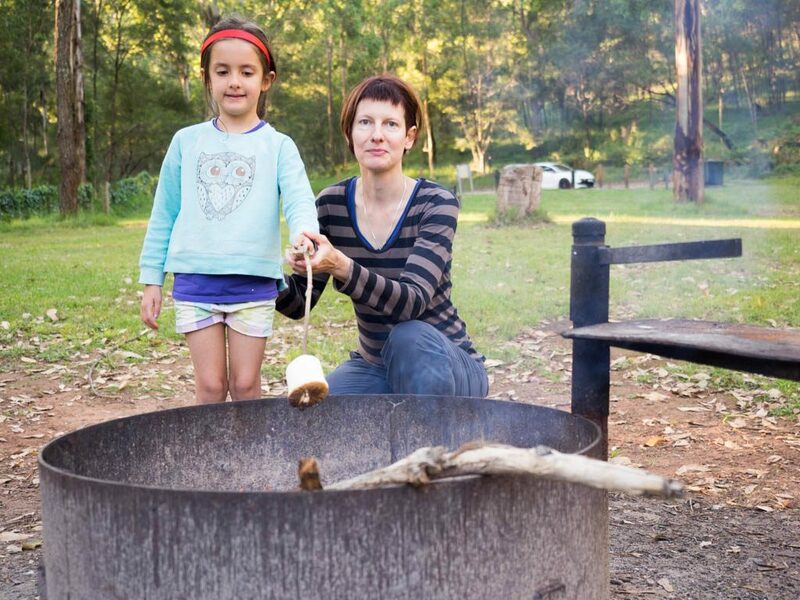 With the weather warming up, it’s time to start dreaming of family camping trips again. One place I’ll definitely be heading is Euroka campground in the foothills of Sydney’s Blue Mountains. 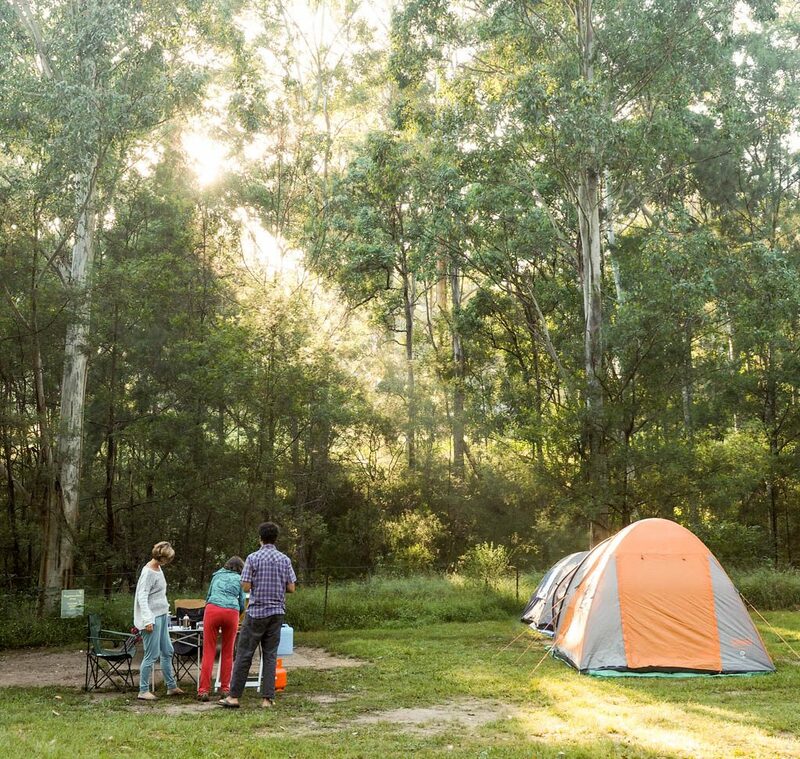 Every Sydney-sider who loves camping must know about Euroka: nestled into a little valley a few kilometres from the township of Glenbrook, it’s an idyllic and secluded bush campsite. 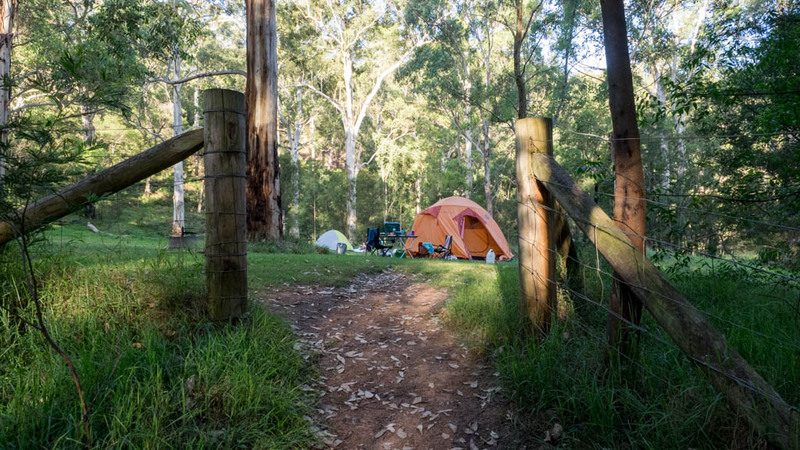 Tall gums surround five grassy areas, totaling only 40 campsites. Facilities are primitive: pit toilets, large picnic benches and fire pits. No power, no running water. Perfect, in other words, if you want to get away from it all without actually having to get away from it all. It’s only 1 -2 hours’ drive from most parts of Sydney. 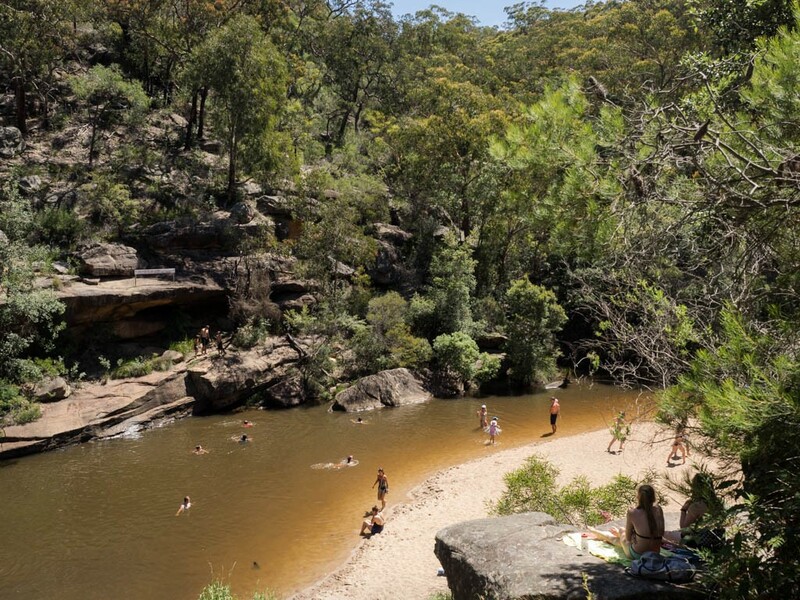 A few minutes’ drive (or a longer walk) takes you to two of the Blue Mountains best water holes: Jellybean Pool and Blue Pool. Jellybean is a bit like the Bondi of the west – but still excellent, especially for kids. Blue Pool is a bit more secluded but can get just as crowded. Blue Pool has a very steep drop-off from the bank so is not suitable for small children. 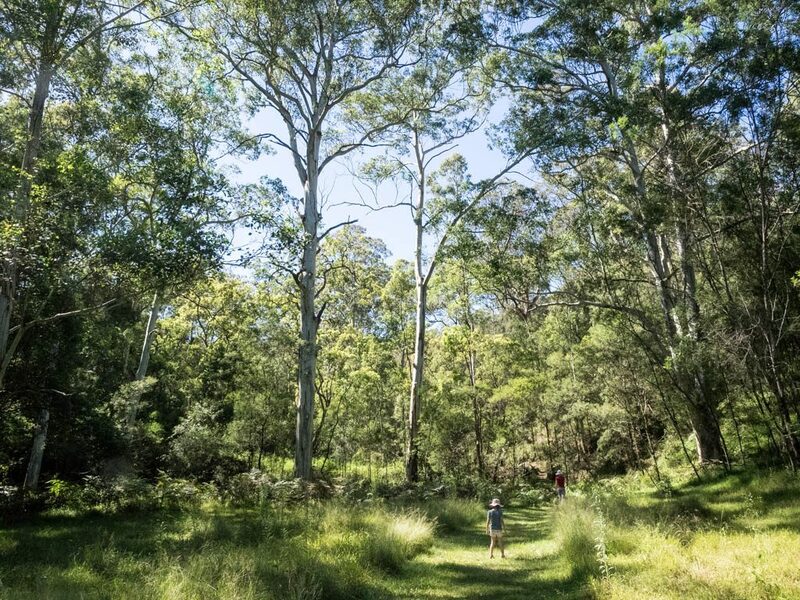 There are a huge number of nearby walks suitable for Children, notably the Euroka Creek Trail, which goes all the way down to the Nepean River and the Red Hands Cave Track. The latter takes you to an aboriginal art site. There are a huge number of longer walks, using the area’s many interlinked tracks. I highly recommend exploring further up Glenbrook Creek for more of an adventure. 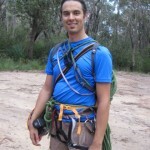 There are five: Red Gum, Nioka, Bennett Ridge, Appletree Flat, and Darug. 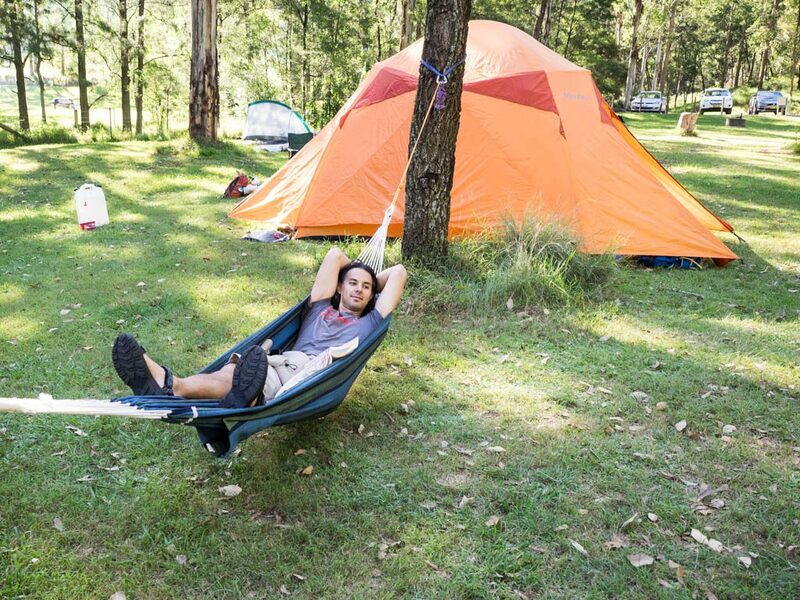 So far, I’ve tried Darug and Appletree Flat, both next to Euroka creek. Darug is on a slight slope while Appletree Flat is, well, pretty flat. Benett Ridge is up higher so will be warmer and possibly more exposed. They’re all beautiful so you can’t really go wrong. Book as a group so you can all be close together. The main thing is that you’ll need to bring in all your own water. I recommend about 15-20L for a family of four per day / 1.5 days, possible a bit more if you want to set up a bush shower. Water does run through Euroka Creek but you’ll need to go upstream a bit (towards Appletree Flat). It’s pretty stagnant around the camping areas. You’ll also need to filter it. Finally, the taps at the National Park entrance station are VERY slow. It will take you at least 5-10mins to fill up a 20L jerry can so fill up at home if you want to save a bit of time. As all the sites are unpowered, you’ll also need all your own lighting, stoves and spare batteries and/or solar panels. I highly recommend a hammock. I’ve brought one on both occasions and managed to string it up between a couple of trees and/or a fence post. Sadly, the kids managed to hog it most of the time. But I suppose it works as a babysitter of sorts too! You should also bring in your own firewood to avoid stripping the area bare. All that fallen wood plays an important ecological role, providing food and shelter for invertebrates while also attenuating erosion. Marshmallows by the fire: an absolute must! I’ve only been in Summer so far and had two very different experiences, ranging from cold nights through to baking hot 30+ days. As it’s in a valley, I imagine it would get especially nippy in Winter. On our second trip, some hoons had a light night party up on Bennet Ridge – a good reason to avoid camping there on a Saturday night if you can. I’ve also been told that sometimes large groups (such as a football team) can book out the whole place on weekends. I love birds and birds also seem to love Euroka, especially sulphur-crested cockatoos. They flock there at dusk to roost for the night: the noise at dusk and dawn is cacophonous. Don’t expect to sleep in and don’t expect to get the kids to sleep until they quieten down after sunset. They fly off during the day, so it’s very peaceful then. I don’t mind paying park fees but they really should include them in the camping fees so you don’t have to get an extra ticket. If you don’t have an annual pass, you will need to pay a daily fee at the park entrance. Visit the National Parks website for all additional info, including fees, booking, facilities, etc.